At Paul Davis Restoration, we enjoy our marketing efforts and we work hard to make our information useful with a bit of fun thrown in for good measure. Below you will find answers to our most recent marketing games and brain teasers. If you are looking for information on our CE Classes, a list of our upcoming classes can be found on our CE Page. Just scroll down to the bottom of the page for registration information. For the most up to date information, follow us on Facebook. That is where we post our daily information and updates. An additional place to get cool information in on our Pinterest Pages. On our Pinterest Boards you will find great Cleaning Tips, DIY Decorating, Disaster Preparation Tips and much more. We even have a Foodie Lovers board. If it is just great information you are looking for, check out our latest Blog Posts. Feel free to use the information to enhance your own social media shout outs. We love to share. The NFL Football Regular Season started September 6th. We post our football contest sheet each week for you to download and fill out. Please return the contest sheets each Thursday by 5pm to be eligible to enter the contest. Click on the link below to download your contest form. football contest week 1 2018 – We are off to a great start for our contest season. 33 agencies participated this week. 16 agencies got less than 9 correct. 10 got 10 correct. 5 got ll correct. 1 got 12 correct – oh so close, but our winner with 13 correct is Mid-Michigan Agency in Shepherd. Congratulations! football contest week 2 2018 – This week was a bit tougher than last week. Most participants got less than 9 correct, 4 got 10 and only one got 11. Our winner is the AAA Mt. Pleasant office. Congrats! football contest week 3 2018 Well, we have a first time winner! Great job Bonham Insurance in Harrison, winner of week #4.
football contest week 4 2018 Participation was down a bit this week. Don’t forget to select your winners and get them sent in by Thursday. This week’s winner by a nose was Diebold Agency out of West Branch. They won with a one point advantage over the nearest contender, Mike Saum State Farm out of White Cloud. Click on the link below to get your Week #5 contest sheet, and best of luck. football contest week 5 2018 We have a first time winner. Congratulations goes to the Weaver Meemic Agency in downtown Bay City. They nailed the tie breaker points to win our Week #5 Contest. 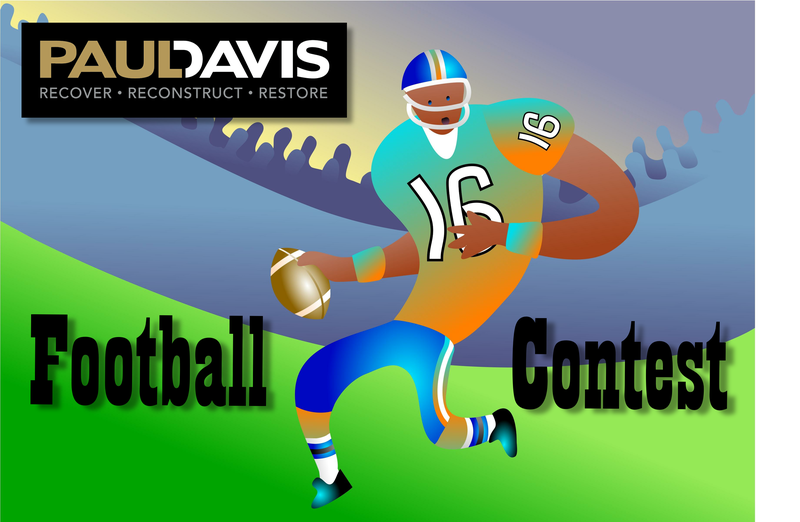 football contest week 6 2018 Congratulations Sedgwick – Independent Adjusters, Bay City. Great job picking the winners this week. football contest week 7 2018 We have another first time winner this week. Faithfully playing pays off again. Congratulations Builders Plumbing Supply in Midland. football contest week 8 2018 We are on a roll for first time winners. This week it is the Karen Tremble Farm Bureau Agency in Standish. Thanks for playing and see you soon for lunch.